Welcome back to Friday DIY, where we spend hours making everyday things, because shopping in stores is for quitters. This week's project is a leather belt, and I was lucky enough to be schooled in the art of belt making by a young man named Maximum Cohen. A few years ago, Max learned how to make belts from a lifelong professional belt-maker who is now in her 80s. He now runs his own small business selling hand-crafted belts and small leathers goods like wallets, too. I'm a total autodidact when it comes to crafting — most of my knowledge of leatherwork, like my knowledge of knitting, sewing, and pattern-drafting, comes from a) books and b) practice, and my skills can therefore be uneven — so it was a pleasure to work with someone trained in this craft. You know, an actual professional. Max showed me into his Williamsburg studio space, where the walls are lined with elaborate tools, sample belts, and product prototypes, and he proceeded to explain, step-by-step, everything I needed to know about leather, belts, and belt-making. Although he uses a few key pieces of specialized equipment to make the belts he sells, Max was happy to show me how to make a belt in a slightly down-and-dirtier, DIY, at-home kind of way. Click any photo to enlarge. In order to make this belt, Max showed me how to cut a belt strap out of a cowhide. This part you likely won't need to do yourself — you'll probably find it easier and more practical to work with what's called a belt blank, a long, straight belt strap. Belt blanks are sold in a variety of colors, or in raw leather suitable for dyeing, and are readily available at craft stores and online. But I thought I'd show you how a belt strap is cut from a hide by hand because it's an interesting process. First, Max unrolled a cowhide he'd just bought from a tannery that uses an eco-friendly tanning process. Cowhides, by the way, are enormous: this is just a half hide, and it covers Max's entire workbench. Max uses full-grain hides (full-grain means the leather comprises the entire thickness of the animal's skin — non-full-grain leather is cut laterally or "split" in order to double or triple the area of a single hide). 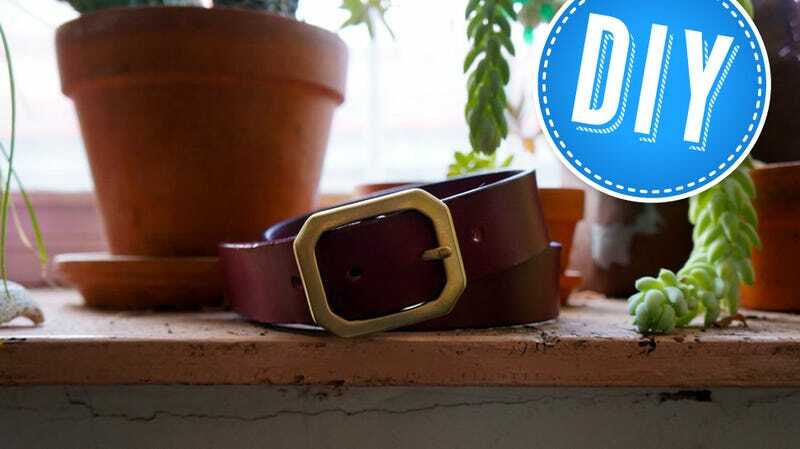 You need full-grain leather for a heavy-duty item like a belt. And this leather is a very heavy weight — leather thickness is measured in weight per square foot, and this hide is around 11-12 oz per square foot. Though very flat, the hide was marked with faint, curved striations. Max explained that these whitish marks were the vestiges of wrinkles resulting from the skin stretching along the cow's back when the animal was alive. Max used nails to tack the hide to his work bench to hold it in place and explained that because of these striations, belts are always cut across the hide — perpendicular to the animal's spine — because the leather is more rigid. If a belt was cut along the animal's spine, over its lifetime the belt would stretch more than is desirable. Max used a long metal ruler and a box cutter to cut a straight line across the hide. Because the width of a belt is determined by its buckle, it was time to pick mine. This is Max's drawer full of buckles. Cool, right? I picked a medium-sized brass buckle with a slightly octagonal shape. You can find new belt buckles at jewelry, craft, and Western supply stores, or search for old ones on eBay and Etsy. I wanted the buckle to have a brushed look instead of the shiny finish it came with. You can achieve that by sanding the buckle with a fine grit sanding block. Follow the sanding block with steel wool. If you work the steel wool in a circular pattern, you'll get a consistent look without any visible strokes. Next, measure the inside of the belt buckle to determine how wide the belt strap should be. Mine was just over 1 1/4". Max explained that belts look and fit best when the strap fits very snugly in the buckle, so we cut the leather at 1 5/16". Again, you probably won't need to do this because belt blanks are available in a variety of sizes, but I enjoyed seeing how Max makes belts from scratch. To make sure the whole length of the belt strap is exactly, perfectly, completely 100% the same width, Max uses this tool. It has a vertical blade and a metal ruler — you turn a screw to set the blade at the exact width you want, and the ergonomic handle has a guide that lines up with the cut edge of the leather hide. Max cut the belt strap with the tool. See how it fits perfectly into the buckle? Normally, Max will cut 30 or 40 belt straps at a time. But today we just did one. Here he is, rolling up the rest of the hide for later. Now you have to edge the belt strap. There are special tools for this that Max normally uses, but if you're doing this at home, you can also use an x-acto knife. You want to bevel the edges of the leather just slightly — on the front (grain side) and back (suede side) of the belt. Working on the grain side of the belt, hold the knife at a slight angle, and aim to take off about 1 millimeter of leather in one long ribbon. On the suede side of the belt, take off closer to 2 millimeters. You want to use long, smooth strokes, and work with a sharp blade so as not to snag the top grain of the leather. Max says he can tell when he's done a good job edging a belt by the ribbons of leather that he removes, which should be long and even. Now the strap is edged and ready, it's time to dye the leather. (If you're working with a raw belt blank that you intend to dye, now is when you'll rejoin this tutorial. If you're working with a belt blank that's already finished in the color that you want, scroll down until the instructions start to explain how to set the buckle.) Wrap the belt strap around your waist and overlap it by about a foot, then cut off the rest to leave a scrap of leather. Test your dye on the scrap. To dye leather, Max recommends Fiebing's brand dyes. (They sell small bottles of dye, too, not just these industrial-size ones Max uses.) The dye works instantly, is permanent, and comes in a variety of colors. Cover your workspace with newspaper and put on latex gloves to handle the dye; it will stain your fingers and anything else it comes in contact with. Using a foam paint brush from any art supply or hardware store, soak the brush in the dye, wipe off the excess, and run the brush gently down the length of the strap. Use consistent speed and pressure to get an even color. The dye is absorbed into the leather almost instantly. Use as many coats as you need. If you're doing more than a couple coats, rotate the belt strap so that half of your strokes begin at each end of the strap. Do this because due to the nature of the foam brush and the rapid absorption of the dye by the leather, more dye is naturally applied at the start of each stroke than at the end. Rotating the strap controls for that. When your strap is dry on one side, turn it over and dye the other side. Again, use as many coats as you need. The suede side is more porous than the grain side, so prepare to use more dye. When you're ready to dye the edges of the belt strap, turn the belt onto its side and gently run the foam brush along the length of the strap. Cheat the brush towards the suede side — because the dye gets darker with each coat, you don't want dye from the sides to seep onto the grain side. Remember, the dye soaks in, so let capillary action draw the dye from the brush up to the very top edge of the strap, without spilling onto the grain side. When the belt has been completely dyed, use a mixture of water and white glue (also known as P.V.A. or wood glue) to seal the belt's edges. The solution is slightly more water than glue — about the consistency of milk. Use a dauber brush or similar to seal the edges, and do it with the same kind of stroke you used to dye the sides — a long, even stroke with a brush cheated to the suede side of the belt, not the grain side. This is because you don't want the glue solution to get on the grain side of the belt. It will stain it. See? I accidentally dripped some of the glue solution on a scrap and it made a big, ugly stain. Do not want. Then burnish the edges with a cloth. Use any woven fiber, like a palm-sized scrap of denim or canvas. (Nothing like a towel, because fuzz from the pile will get stuck in the glue.) Hold one end of the belt securely and use your other hand to wrap the cloth around the belt. Just rub the cloth into the edges, right down the length of the belt. The finished edges will look shiny and slightly darker than the grain, like this. Now you need to set the buckle. (Here is where you will rejoin our tutorial if you are working with a pre-dyed belt blank.) To set the buckle, you have to first shave down one end of the belt strap so it can fit around your buckle without adding unnecessary bulk. Bend the leather strap over as close to the end as you can, and use an awl to mark a line across the suede side of the strap where it overlaps. Also on the suede side, use a sharp knife to gently shave away about half the thickness of the leather from that line forward. Max has a fancy tool that he uses to do this, but with patience you can do it at home with a big knife. Hold the knife at a flat angle and shave carefully. You don't want to pierce the leather or make it too thin. Here is the shaved belt end. We've shaved enough away to expose the natural leather underneath the dye. Fold the leather over again so that the cut edge lines up with the edge of the shaved area. Use the awl to make a mark in the center of that fold in the middle of that strap. Then unfold the belt and make two additional marks 1/2" to either side of the center mark. Hole-punch through the two outside marks. Then use a wood chisel and a hammer to cut a straight line connecting the two holes. This will create a 1" long oval shaped hole in the belt for the buckle tongue. Push the tongue through the hole and fold the leather strap around the bar of the buckle. Everything should fit nice and snugly. Max used a pipe cleaner to dye the inside of the hole, because he is a perfectionist. Working on a protected surface, use a little rubber cement to glue the belt together. We'll also stitch the belt, but glue helps hold things in place. Press the glued end down, then turn the belt over. Working on a cutting board, work bench, or other protected surface, use your awl to mark an even line of stitching holes about 1/4" apart. Then hammer the awl through each mark. It may take a lot of force to get through both layers, depending on the thickness of your belt. That will leave you with stitching holes like this. If your thick nylon thread isn't already a color that matches your belt, dye white thread with the Fiebing's leather dye. It will soak up the dye instantly and dry in a few moments. Then thread a needle. Note: this photo shows me sewing with a single thread, but don't do that — sew with a doubled thread for strong stitches. I fixed that mistake and started sewing with a doubled thread, but I didn't remember to take a photo. Saddle-stitch back and forth, in and out, through each hole until you come back to the hole from which your thread tail protrudes. At that point, push your needle through to the same side as your thread tail. Then push your needle back through the same hole you just came out of — yes, it seems wrong, bear with me — to create a thread loop. Tuck the thread tail into that loop. Then pull on the needle, tugging the thread loop back into the awl hole. Take the thread tail in one hand and the needle in the other and pull in opposite directions. This action will lock the threads in place, creating a knot that's buried in the hole itself. Use embroidery scissors to trim the protruding ends of the thread front and back. Then run a lighter along the stitching to seal it. Now all that's left to do is trim and shape the end of the belt and punch the holes. Slip the belt through the loops of your waistband and feed the end of the strap through the buckle. Use an awl to make a light mark in the center of the buckle. This will be your guide hole. On a flat surface, use your awl to mark 3-4 holes at 1" intervals around your guide hole. Also make a mark on the center of the strap exactly 5 1/2" from the guide hole. That is where you'll cut your belt. This is what your scored belt should look like. Use an x-acto knife to cut along the scored lines. Then, use a dauber to dye the newly cut edge. And some of the milky water-and-glue solution to seal it. Then punch the holes with a hole punch. You want to center your holes on the awl marks you made earlier. Before I punched all the way through, I used the hole punch to lightly dent the leather to check I was centered. And then you have a brand new belt.